On September 11, 2001, 3,000 lives were taken when two airplanes hit the World Trade Center in New York City , one airplane slammed into the Pentagon, in Washington D.C. and one in an open field in Pennsylvania, many believed was headed for the Capitol. This was an act of terrorism that our country was not accoustomed to, sure we heard about similar acts in other countries, or in our history books, but never as an eyewitness. It changed our country’s view of safety, it launched us into a war we are still fighting, back then we thought were safe, but now all we wait for is for the terrorists to do it again. The truth is, our country has been fighting acts of terrorism since before the signing of the Declaration of Independence. In the later half of the 18th-century, an American Revolution broke out when the 13 colonies joined to make the United States of America. On April 14, 1865 President Abraham Lincoln was shot and killed by actor John Wilkes Booth just days after the Civil War was drawing to a close. Our country has gone through two World Wars, on Dec. 7, 1941, the naval base on Pearl Harbor in Hawaii was attacked by the Japanese navy. This was a preventative action to keep U.S. Pacific Fleet from interfering with military actions with the Empire of Japan was planning in Southeast Asia against overseas territories of the United Kingdom, the Netherlands and the United States. On November 22,1963, Lee Harvey Oswald shot President John F. Kennedy while the Presidential motorcade drove openly in the streets of Dallas, Texas. This was an act of terrorism, an act that changed our nation in many ways for years to come. 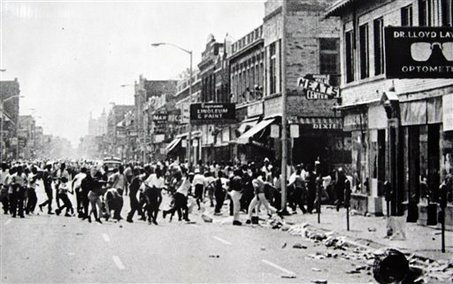 In Detroit on July 23, 1967, a police rade of an unlicensed after-hours bar known then as the “blindpig” located on the corner of 12 and Clairmont Streets near Detroit’s West side, police confrontations with patrons and observers evolved into one of the deadliest and destructive riots/insurrections in American history lasting for five days surpassing the violence and property destruction of Detroit’s 1943 race riot which occurred 24 years earlier. This act of terrorism, was recounted in the beginning of Book 3 of “Middlesex”, now while I usually wait for the end, I felt strongly about what I read and I felt I could form an opinion about this. The truth is, it would be a joke to think we are safe from terrorists both overseas and domestic. We aren’t. In the last 10 years or so , we have experienced acts of terrorism in our schools beginning with Columbine High School, in Littleton, Colorado, on April 20, 1999 and Virginia Tech in Blacksburg, Virginia on April 16, 2007. Believe it or not, it has and can happen in our own backyards. Generations of families have buried loved ones because of war. It isn’t happening “over there” it is happening right here and while we are a long way away from stopping war, we must certainly try. War of any kind changes people, it changes a community and a nation. What I also realized while I was reading this section was that Calliope’s theory about war has not changed much in the last 4o something years. We still have this naive notion that stuff like that happens “over there” wherever “over there” actually is. In reality, we have experienced as a nation many acts of violence and terrorism in front of our own two eyes. I’m sorry if this may be too political to some readers, but I felt it should be noted.